The Chicago Bears did something last week that they haven’t done since 2007: Lose three consecutive games at home in a season. 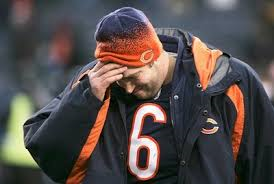 The Bears lost 27-14 to Miami, giving them an 0-3 record at Soldier Field this season. It’s the first time they have lost three in a row at home since the 2007 season. The Bears join the Jets, Oakland, St. Louis and Tampa Bay as the NFL teams this year that have lost three straight games at home. On the other side of this stat are the New Patriots. Bill Belichick’s squad has not lost three consecutive home games since 1995, 18-plus seasons without a three-game losing streak at home in a season. The New Orleans Saints are next on the list; they have not lost three straight in a season at home since 2005. Here’s a look at the last time each of the 32 NFL franchises lost three straight at home in a season.